Pours a light to medium amber hue with a large, fizzy and foamy off-white head with great retention. Body is very active which supports the head retention. Lacing is thin and watery with very little gripping power. Having settled out, the body color has lightened a bit towards the light amber side. Head has become fizzy and somewhat frothy. Initially the nose detected a strong green apple presence. It was very pleasant and inviting. Light doughy malts were detected, without a noticeable hop presence. The initial taste is slightly bitter with a subtle maltiness and finishes with the same light bitterness with a slight medicinal quality to it. Not much balance from malts. 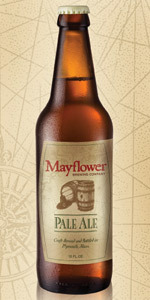 With an actively carbonated presence on the mouth, the light bodied Mayflower Pale ale leaves the palate with a dry chalky finish. This beer just didn't live up to our expectations. Perhaps its the bottle, who knows, considering the over-carbonated pour. For a British-style pale ale, I was expecting a little more malt (there shouldn't be much we didn't get any) in the taste. The bitterness levels were good. If you're hoping for an in-your-face pale ale, keep looking. The hop presence is more subtle and the body isn't there. Reviewed on June 12th, 2009.